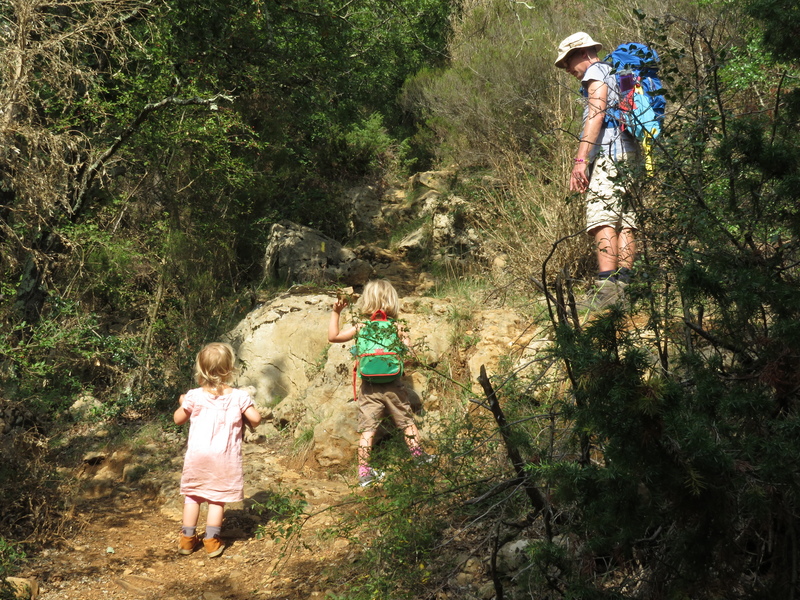 Tech writer, organiser, outdoor and cycle mad geek, and new mum to two strong-willed and cute little folk - from the UK but now charting new waters in the French countryside. I’ve been playing with the layout and the template and there will be more changes to come. That means I’m no longer updating this one. Here’s a link to my latest post, about DS starting at maternelle. Click on the image to see the full article – and the new blog! If you’re living in France and have been here more than six months, you’re legally obliged to swap your UK license for a French one. I’d say that’s a little known fact. Most people don’t bother and while I’ve heard that that’s not usually a problem (and not something the gendarmes pulled me up on when I was stopped a few months back) it is a requirement, so could cause problems. So how to go about it? The process of transferring your non-French license to a French one is actually pretty straight forward. The only complication, as with all things French, is collating all the paperwork involved and filling out the forms. The two forms you need are Cerfa form No. 1487901 and Cerfa form No. 1494801. Both can be downloaded from Service-Public.fr, as with all these forms. Along with the two completed forms you also need the following paperwork. Proof of identity, such as a copy of your passport or other ID card. Proof of residence, such as an Attestation de Domicile, which you can get from your local mairie, or a carte de sejour. If you are European, Swiss or Monegasque you must also provide proof that you have been resident in France for at least 6 months. Examples of this include a rental contract, employment contract, avis d’impôt, etc. If you are not a European citizen, you must provide your residence permit or the Ofii sticker affixed to your passport. You need three photos, two of which you are required to attach to the Cerfa forms. If you live in the departments of Corse du Sud, Haute-Corse, Réunion, Guyane, Martinique, Mayotte, a cheque for the amount of the regional tax payable; otherwise no payment is needed. In order to receive your license you must include one of the pink pre-stamped 50g prêt à poster lettre suivie envelopes (available from your local La Poste) labelled with your name and address. So, what about these forms. As with so many French forms, there are a lot of boxes and it looks intimidating, but it’s actually fairly straight forward and standard stuff of an official document. Give your surname (nom) and first name (prenom), address, etc. The lower part of the form is only necessary if a legal guardian or representative is completing the form on your behalf. In which case the information required is almost identical to that required in the first part of the form but with the other person’s details. Attach your photograph to the space provided, and it’s ready. This it the one where you need to provide details from your current non-French license. Select this if you are a resident of an EU country. Select this option if you are none of the above. Nationalié(s) au moment de lóbtention du permis is your nationality at the time your current license was issued. For me that means English (anglaise). Nationalité(s) atuelle(s) is your current nationality. That’s English (anglaise) again for me as this hasn’t changed since my license was issued. État de délivrance du titre à échanger means the country that issued your license. Date dóbtention ou de deliverance means the date your current license expires. No du permis de conduire is your current driving license’s number. On the UK license this is a long number starting with alphanumeric characters taken from your surname. It can be found on your driving license. On the UK card license it’s the field numbered 5. The rest of the form involves completing the vehicle categories. When I first looked at this and compared it to my paper license my heart sank because there was no correlation. Then I flipped the card license over and, hey presto! There is a very similar looking table with matching categories. Copy them over one by one. The first columns are for the start dates and the second column for the end dates, with jour, mois, and année the day (e.g., 01), month (e.g., 02) and year. Examples of UK driving license cards are on the Government website. When you’ve got all this information together, affix your photograph in the appropriate places and then send off the forms along with your supporting documents and, if needed, payment. Then you wait. How long you wait will depend on many factors. Word on various Expat forums suggesting anything between 8 weeks and 8 months! We sent our forms off in August and are waiting to hear back. A feature of French life is that things move slowly, especially when paperwork and the postal service are involved, so watch this space! This is annual event put on by the MJC in Puivert – a celebration of the Winter solstice and the return of the light. This year it took place on the 19th December – a while ago now, which is why it’s beyond time to publish this post. I love that the French (at least, locally) celebrate these pagan festivals. It says much of their connection with nature, which there is so much of compared the UK, and may also be something to do with the fact that they are (apparently) known as a nation of farmers – vs. Brits, which are said to be (by the French) a nation of shopkeepers! The event itself is usually preceded by two or three afternoons of lantern making. Despite our best intentions these sesssions, just like last year, so once again we ended up hastily DIY-ing some lanterns at home on the weekend before the festival. Wanting to improve on our efforts of the previous year we tried doing it properly, which meant sticks and tape, PVA glue and tissue paper, except we used crepe paper, which really didn’t work as well. That aside, we ended up with passable lanterns and also had last year’s at hand as backup. On the night of the fête, the event starts in the halle opposite the post office where everyone gathers to light their lanterns. Usually there is some sort of introduction with traditional songs, music, and then a procession from the village to the lakes. This is the highlight for me, but this year we missed it, unfortunately – so no photos other than those of us making our solitary walk along the same route a short while later. There some nice photographs on the MJC’s website which are worth a look. After the short walk everyone gathers at the lake, where there is a buvette selling refreshments (vin chaud, chocolat chaud, and cakes) and a fire pit. Usually the organisers hand out Chinese lanterns that are lit altogether and sent off into the sky — a beautiful sight, if not a little concerning on the environmental front, but no forest fires were started, as far as I know. This year, after the procession and the lantern-lighting – there was a spectacle centred around the lake, with an illuminated unicorn boat approaching the beach, with the dame blanche waving a torch bearer as he waded through the water to the short, delivering the light for the coming year (I presume that was the symbolism of it.) The dame blanche is a European and American legend (more about this on Wikipedia) as well as local one, as it is said that she haunts the ruined castle in Puivert, as she also does many other ruins across Europe. Despite being dead, she’s a busy woman! Alongside the spectacle (which was hard to follow because DD kept trying to run off with her friends – a nightmare to keep up with in the dark!) there was music, a large open fire pit, and – later – some fire dancing and drumming. Both times we’ve been we missed the later goings on as it ends up being too late for the little ones, and often too cold too. We were lucky this year that it was a relatively mild night but still by 7pm they were ready to go home. So home we went. Next year we will have to make sure we make it in time to the procession and the Chinese lantern lighting, since I think (with children in tow) that’s the nicest part of the event. We just need to be more organised – and also to say no to waiting for friends. (James’s idea. I’m over it.) One day we’ll be able to go with children capable of not getting lost, falling into the cold water, or being abducted by strangers, and then I hope to enjoy the evening a little more. For any parents of older children (or generally of a more relaxed disposition) or sans enfants, it’s a lovely evening, I’m sure! As an aside, I’m always struck by the magnificent flyers for these local events, and this one is no exception. If you like them too, head over to www.angela-design.fr to see more of her work. It’s December. It’s definitely colder than summer, but compared to our two previous years here so far winter is shaping up to be a much milder – and therefore, more enjoyable, winter. We’ve got sunshine most days, which is great and means we’re burning our way through the wood pile at a much slower pace. 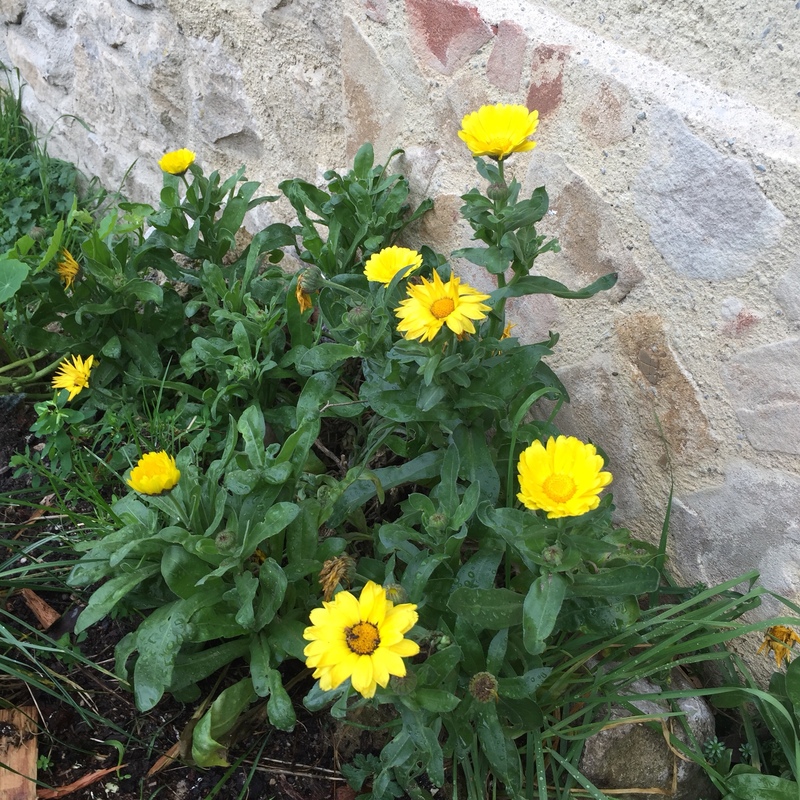 One of the most amazing things – to me at least – about this time of year in France, is the way that things keep on growing, which I suppose, if you think that winter temperatures here are more like Spring temperatures in the UK, makes sense. So what’s growing? 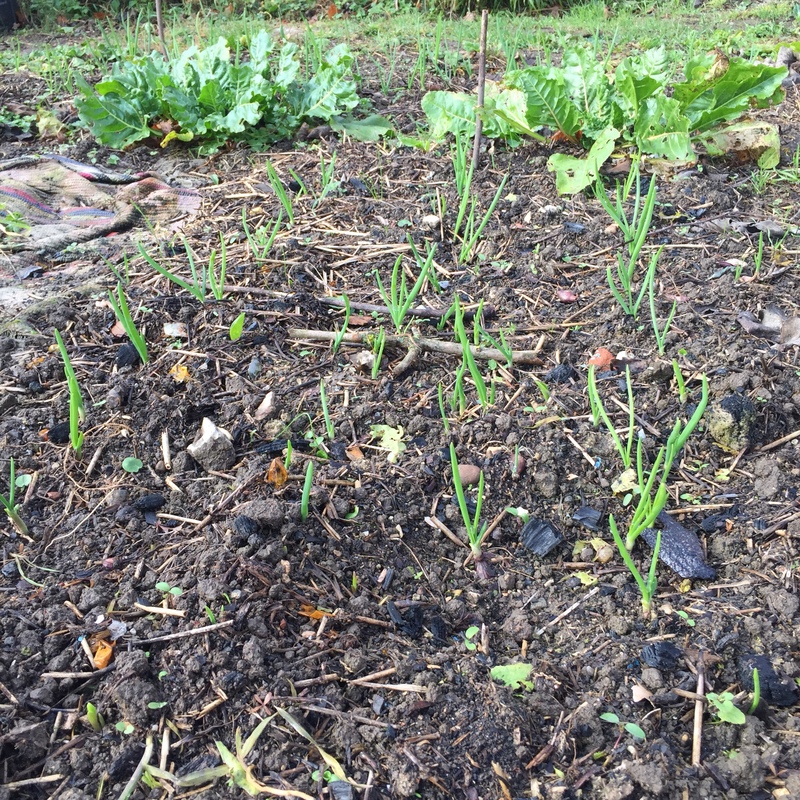 Well, we have onions making light work of it in the veggie patch. We’re planning to extend the patch onto another piece of land next year so I decided to plant up the neighbour’s garden with easy to grow stuff that will overwinter. I’ve also set aside an area for hardwood cuttings, so have a row of redcurrants and blackcurrants, and another of hazel. Talking to a neighbour and reading in the Gardening with the Moon calendar (I have the diary version, called Jardiner avec la Lune), it seemed that November was a good month to sew peas and broad beans, so that’s what I did. My neighbour is very keen on permaculture, as am I, but I think it means slightly different things to each of us. She’s a bit obsessed with hummus at the moment. So after I cleared an area of the veggie patch and created a fleece tunnel, ready for planting the broad beans and peas, and showed it to her, she turned her nose up and suggested something a little less organised. So now I have broad beans in the tunnel and others stuck into the ground and marked with sticks. It’s game on. We’ll see which ones come up first and do best. While I think it’s a lovely idea to have a wild vegetable garden, there are advantages to having a dedicated patch. One being aerated soil. I’ll make sure to mulch the area designated to the wild bean patch, because without that those plants are going to struggle, for sure. Pea shoots – since eaten by greedy slugs! What else? Oh yes – flowers. It’s December now, remember. Two days after the shortest day, no less, and yes, there are still flowers. 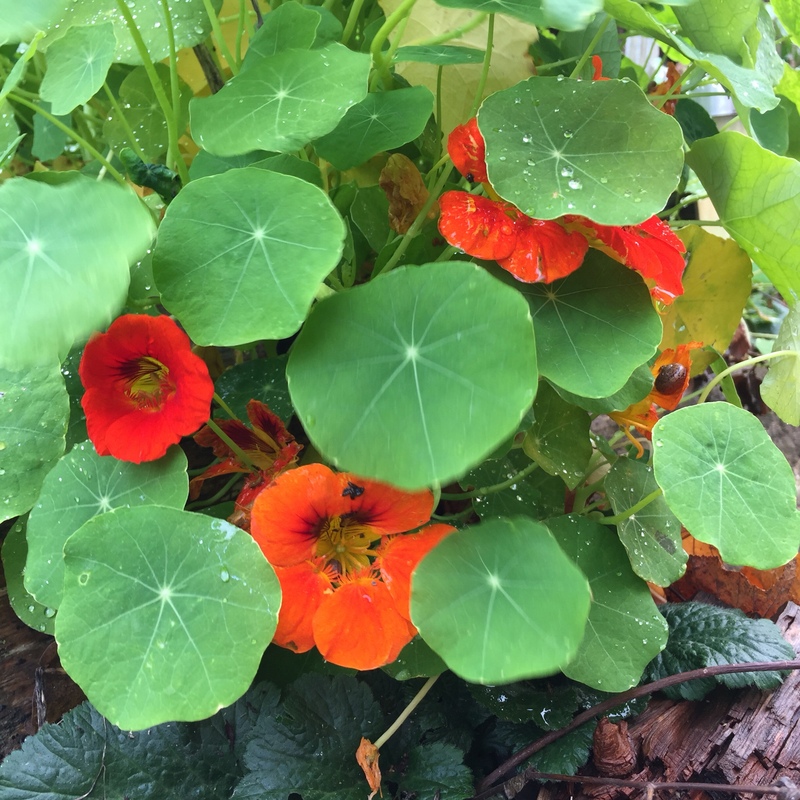 The bed outside the front of the house, which gets hardly any direct sunlight at this time of year, has a nasturtium there going great guns. I planted some seeds in Spring and they’ve self-seeded three times since then. Then there are the marigolds. At the front of the house they’re up against the wall, so as good as in deep shade. They barely get any light at all except for first thing in the morning for an hour, max, but still they grow and flower. It’s remarkable! Roses are still growing too. I was never a fan of roses in the UK. There was always something stuffy about Rose Gardens, not least all the space waster around them! but here the roses are something else. The varieties I’ve seen – and smelled – locally are so vigorous, with stunning colours and strong scents. Quite different from many of the more ornamental varieties that I think dominate the UK. I like them so much I’ll be adding them to my garden, when I finally get one. Other plants on my cuttings list include buddleja (there’s one on the way to the village), rosemary, lavender, and kiwi. The last three of those are best done in the spring. For the buddleja I just need to remember my secateurs when I’m walking past next time! Food wise, we are still overflowing with the chard that came up all over the garden, a remnant from the previous green-fingered tenant. It’s very welcome at this time of year, so handy to be able to nip around the corner and come back with an armful of fresh greens. Another one for the permanent patch, when we get to it. We went to the park. We walked. Some shorter walks together as a four and a longer one with friends. 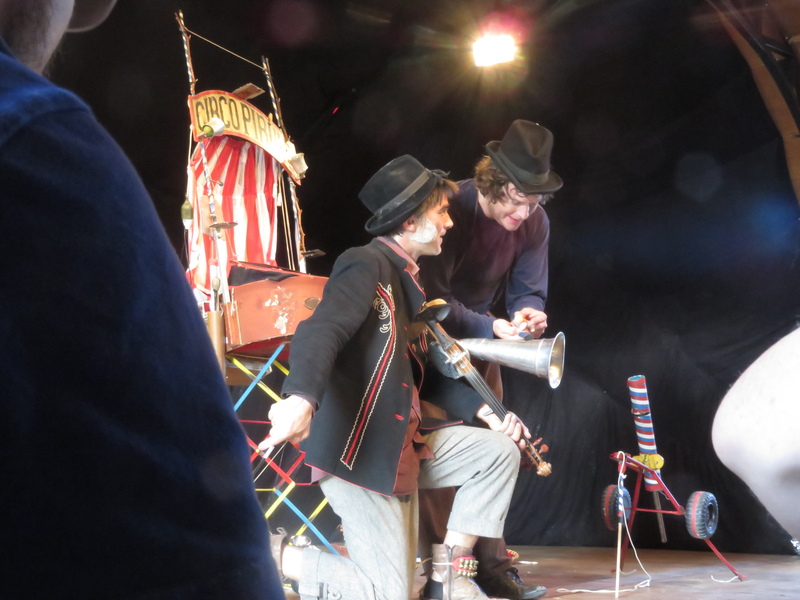 We enjoyed the autumn sun and went to the free theatre festival, un pave dans la malle, which is just up the road. This year DD was old enough to enjoy a show and we saw a really funny one about a miniature circus with a terrible safety record (all the miniature circus creatures were killed off one by one!) Apart from the climbing inside a horse routine, which I think was a bit too much, it was excellent. A really good choice for the five year olds – and lots of adult jokes to keep us entertained. Or so I’m told. My French as it is I think a lot of the nuance was lost on me though so I probably enjoyed it on the same level as the kids. We had visitors (my parents). We had a lot of problems with the car. It needed new suspension (or something), new tyres, and new brakes. It was VERY expensive, although we saved about 300% on the cost of parts thanks to Magic Mark (as I call him) and his generosity in buying and shipping parts to us from the UK for only a small markup. If you’re anywhere near to Huddersfield and drive a VW, Skoda, Seat, or Audi then look up IVS Huddersfield because their service brilliant. 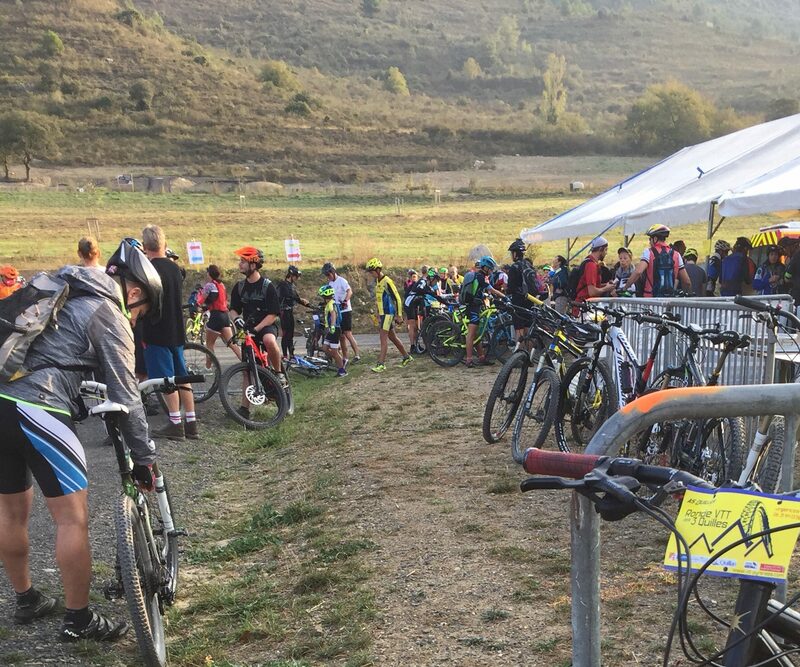 We had a lot of fun in the new bike park at Quillan, which thankfully wasn’t washed away in the terrible floods that were experienced in our area during this time. The tragedy of the month of course being the floods, which washed away many roads and bridges, devastated communities and also took many lives. It reminded me of floods we had in the UK many years ago and also to be grateful that we live on a hill – and to add “make sure you’re not next to the river” to the land or house buying checklist! Floods can and do happen and living so close to the mountains colossal quantities of rain can fall at any time. Temperatures have fallen a bit and there’s been some rain but in between, so far, we have sunny days. It’s warm in the sun, so it’s a shame that we are living in this East-West facing house as we don’t get much benefit from it and it will stay that way now until next Spring. Needless to say the wood burner is on. We intended to wait until November 1st to light it but had to concede defeat on October 29th on a day when there was no sun and the temperature was in single figures. Chilly – and the house was starting to feel damp. We have a lot on in November too – and are busy working away on house plans. At the end of next year the thermal study parameters for new builds change, meaning it will be more expensive to insulate a house. We need to find land before then and get a permit. Having our plans at the ready will make that easier. Aside from work, life, kids, etc. that’s our focus for now. 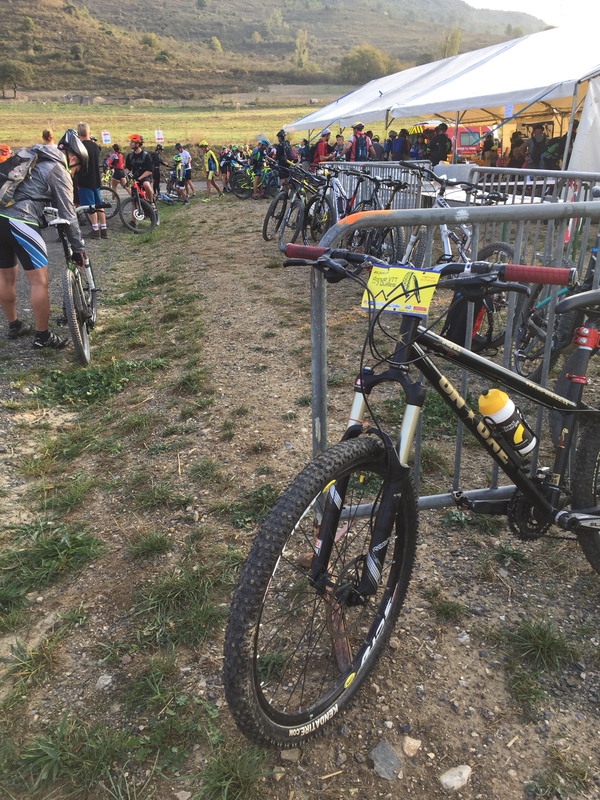 A regular mountain biking event in Quillan. Routes are usually 15km, 30km, and 45km. There’s a very impressive buffet at the end. Entry gets you a beer and hotdog token too. And there’s the free beaker. The two-year anniversary of our arrival in France came earlier this month and passed without the slightest hint of a bang. A day I’d hoped we’d mark with some kind of celebration – or at least acknowledge – became a day of stress with us viewing two more unsuitable pieces of land (north facing, etc., – the usual) and having heated discussions about a plot we saw a while ago. It’s a plot that I like and think a few compromises are worth it but James is struggling with compromise, period. Maybe he’s right to stand firm. I’ll say no more lest the argument begins again! Anyway, the fact that it’s been two years is remarkable. Time seems to march on irrespective of what we do. The children grow but so slowly we hardly notice in the day-to-day. Then one day we see the changes. Their bodies are longer and more robust, their language has changed, their expressions, and all the while their personalities stay the same. The evolution is so natural, so inevitable. Their eyes, their energies are the same as the days they were born. It’s a magical thing to facilitate and to witness. They have both adapted so well. DD is as good as bilingual and DS, who is just starting to master English understands pretty much everything that is said to him in French. When he’s ready to start speaking the language, I’m sure he’ll blow us away. By the end of our first year he’d spent more of his little life in this country than his country of birth but it’s been in this second year that he’s been exposed to the language. This time last year I was trying to settle him into creche. A year on he now asks to go. He’s happy there, as DD is happy at her school. Home-wise we’re a long way from where we wanted to be. And that’s fine. I’m happy with what we have and what we don’t. It’s been a big learning curve for us and we’ve made some sensible decisions and had some lucky escapes from some stupid ones! I know some people just turn up for two weeks and find a house, but that’s not the way it’s working out for us and so be it. Part of me wishes we’d bought 10 years ago, when it was just me and James and we had a full salary to cover repairs. But then I suspect now we’d be stuck up in the mountains with two children, wishing we could be somewhere busier, more accessible, and also wishing we had the money for the new roof we need. So why haven’t we found anything? Honestly, the state of some of these houses is just depressing. They’re fine if you want something for a few weeks in the summer. No-one cares about an old uninsulated roof when it’s 35 degrees C outside. Likewise, the house’s aspect. A stone East-West or North facing house provides a welcome respite from the sun in July. Not so in winter, where temperatures can fall below freezing and stay that way for weeks. Last winter we had no sun so even the well-position houses felt the cold (and damp) but the first year, while it was cold the sun shone almost every day. With this, one side of the valley stays buried deep in frost while the other basks in the winter sun, where clothes can still be dried, children play, life goes on much as before – but in jumpers and woolly socks. Any house that ticks our boxes (that’s 8/10 for me and 10/10 for James) comes at a price we can’t afford. Anything we can like is on the market at cost + however much was spent on repairs + imaginary profit. Anything we can afford requires money spending on it to get it how we want it – and by that I’m not trying to win any Home & Garden awards, just to have a liveable house that we can is warm and dry in winter. By the time that money’s factored in we’re back in the range of houses we can’t afford! So there’s that. Add onto this the shoddy workmanship that goes on. There are so many builders, carpenters, handymen (it’s usually men) here. But trained where? With what qualifications? From what I’ve seen, all self-taught, either learned on the job from someone equally as unskilled, or by doing their own build or renovation project. It’s mind boggling how lacking in common sense some of these apparently registered artisans have when it comes to construction. There’s a renovation in a hameau close to us being carried out by an apparently reputable builder (registered, advertising with a large billboard on the side of the road) and wow, the workmanship is downright dangerous! The roof looks good, admittedly – all new timbers – so once it’s all finished (as in rendered and plastered) you could walk in and no doubt it’ll look great, but what’s hidden behind there is an archway without a supporting lintel, just breeze blocks at the top of the gap. That’s one of the worst things we’ve seen but it’s not an isolated find. I have other examples like this and a blog post about it in draft. I send the pictures to my dad from time to time (he’s an old-style 5-year apprenticeship on site type of actual carpenter who’s seen it all) and he can’t quite believe it either. The idea that we might spend our actual money on a house that’s been repaired/renovated/built by someone who was in all likelihood winging it. Not exactly reassuring. Lazing around watching the sunlight on the cotton-like seeds of willow. I love days like these. Which is why we’re looking for land. And the search continues. And it will go on. We’ve decided to focus less on the house (we’re renting a “good house” at the moment, as in plenty of space and warm in winter) and more on the life side of things. That’s why I’ve been trying to get my business going and also we’ve been enjoying spending this time, while we can still afford to be very part time, with the smalls. This phase won’t last for much longer, I know. With DS approaching his third birthday, he’ll soon be at maternelle along with DS and then it won’t be long after that before they are out all day every day for most of the week. I’ll be ready for it but I know it will be bittersweet and that I’ll look back on these slow-progress no -progress years (by adult standards) as some of the best. Would your British neighbours let you use their garden – no strings attached? Here they do, so this year we’ve been able to grow some veggies. Language-wise, I doubt I’ll ever reach a standard I’m totally happy with. I like to talk so it can be incredibly frustrating not to be able to talk to anyone and everyone. Chit chat is something I miss, in the shop, in the post office, in the street. Without that there’s always a barrier. Our neighbours here are lovely, they know we want to chat. A few times I’ve become upset when not being able to say what I want. It does get me down. And that’s why I have to keep trying. It’s paying off little by little. Today I spent 30 minutes at the French equivalent of the local council office sorting out an ongoing admin issue (the system for paying the bins is exceptionally complicated, it seems) All In French. Yes, check me out. That is one hell of a change from two years ago. It’s exciting, actually. Having the time to work on this some more is one of the reasons I probably won’t notice my kids are in school full time once that happens. I have so much to do. Like them, I like to learn and I like to be busy. Which is lucky! Lucky to be here everyday, not just on holiday. Am I glad we came? Hell, yes! Would I go back? Actually, no. I really don’t want to go back and can’t see myself going back, ever. There are many ways that life is better here, not least the weather! So what’s in store for year 3? For one I hope I’ll start to be able to understand what the locals are saying to me. That would make life drastically easier! I’d like to get my business going and making enough to cover rent and bills as that enables us to relax a bit more about the fact that we haven’t found what we’re after. I also have a new venture to work on with James, but that requires extra time that we just don’t have but will have one both children are at maternelle, so all eyes on that bit change. Finally, I got an e-mail this morning about arranging a cycle tour. Since cycling is my passion this is a really big deal for me and gives me a reason to be very excited indeed about 2019. This activity is very time consuming and being able to do that full time dependent on quite a few other things, so this next year is the perfect time to dip my toe into the water and see where it leads. It’s all go and I love it.